I must admit it was a LONG last nine months while I was pregnant without an occasional drink or two! I really do enjoy the occasional margarita, glass of wine, or mixed drink when getting together with friends, family or just a night in or out with my hubby! I am so glad I have my beautiful baby girl now because I get to try my new favorite vodka- WAVE Vodka! I Love fun, colorful drinks because it makes it that much more FUN! WAVE vodka and their awesome selection of fun and tasty flavored vodkas make the perfect, tasty, and fun drink for any party this summer! I can't wait to share all these great flavors with family and friends this summer for cookouts, get togethers and special occasions! What is even more exciting is that WAVE Vodka just launched two new exciting flavors to its already great selection: WAVE Baja and WAVE Lemon Lime. 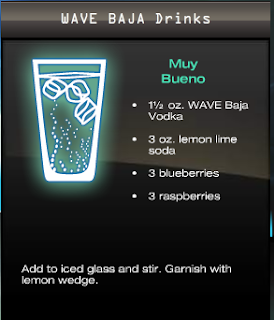 The WAVE Baja is definitely one of my FAVORITES from their selection so I am so glad they decided to add it! It is the perfect mix of exotic tropical fruit blends and it really reminds me of vacation in Mexico or another warm place! And if you need a little inspiration like I do when I make drinks, make sure to check out their great recipe section on their site! Their recipes are super easy to make and don't take a lot of ingredients - you will have most already in your house! I have included two of my favorite easy recipes from my two favorite flavors: Baja and Whipped Cream. These are perfect to whip up this summer for any occasion and they are sure to impress and refresh all of your guests!! Buy It: You can purchase the WAVE flavors in the following sizes: 1.75L, 1L, 750 ml, and 50 ml and suggested retail pricing is $8.99 for a 750ml bottle.